Their new album is entitled Thirty Three And A Third and will be released on November 16, 2018 (Onside Records). You can order it now on Amazon.com. Come join international artist, Grace Brancale, on another musical journey in her latest release called, Vacations Vol. 1. Inside this treasure, you will find an audio, anytime vacation full of passionate, musical paintings depicting the atmosphere, ambiance, or the memory of a vacation activity. Whether enjoying the day by the shore, on the beach, on a cruise, on an exotic trek through the rain forest, at a festival, relaxing under a big, open, sparkling, starry sky, staying at your own villa at a tropical paradise, or savoring an unrushed, easy morning or even your kind of stay cation, Grace Brancale’s album will take you on an audio journey any time you play these singles. There’s even a composition in her album about escaping via plane high above the clouds to your vacation destination. With singles featured on local and global smooth jazz radio stations like smoothjazz.com, Grace Brancale has been described as an internationally acclaimed artist that emerges with a soulful, dreamy sound, surrounding her lyrical, rhythmic ivory melodies with seductive grooves and sensual, soaring ambiances. Her musical roots as a composer, multi-instrumentalist, and classically trained pianist are her tools to create the perfect smooth jazz atmosphere for chilling and rejuvenating. Listeners across 216 countries have been enjoying her music since it first debuted August 2017 and many across the US and around the world have reached out to her to let her know they are a fan of her music because of its universal appeal and their personal connection with it. Sound cloud features have described her work as passionate, original smooth jazz featuring musical paintings. Be sure to add Grace Brancale’s Vacations Vol. 1 album to your collection today to start enjoying your own “anytime vacations”. 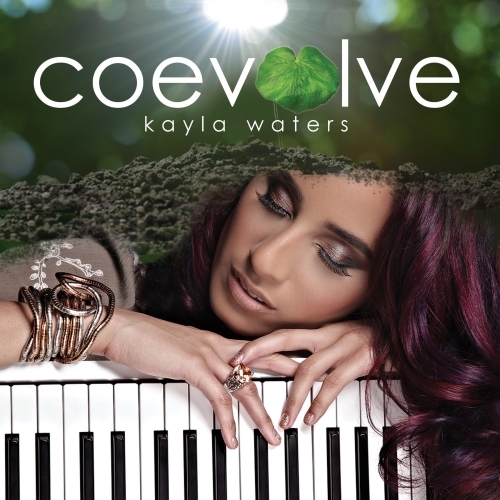 With Apogee pianist and composer Kayla Waters, introduced by her famous dad saxophonist Kim Waters, had her first surprise success. This year we can admire her following album Coevolve. As on the previous album Kayla was supported by her father. Further artists on the new album are guitarists Freddie Fox and Nick Colionne, bassist Mel Brown, and vocalist Shacara Rogers. Kayla’s perfectly developed sense for fine harmonies finds its expression in the starting tune Zephyr. It’s the name of the Greek god of the west winds. The lightness of the wind can be discovered in Kayla’s emotional keystrokes. Heralded as “one of the most musical guitarists of our times,” by author and jazz critic Ted Gioia, Bobby Broom has spent the new millennium focusing on his musical output as a leader. He has recorded with both his Bobby Broom Trio and the disbanded, Deep Blue Organ Trio for the Premonition, Delmark and Origin labels. His Plays for Monk was released in spring 2009, The Way I Play in April 2008, and Deep Blue’s Wonderfu1! in 2011 and Folk Music in 2007. Bobby was recognized as one of the top guitarists in Down Beat magazine’s annual Critics Poll for 3 years, from 2012–2014. His Deep Blue CD, Wonderfu1!, reached number one on both US national jazz radio charts. Broom’s latest recording is with his new organ group, the Bobby Broom Organi-Sation, which was the opening act for Steely Dan’s fifty-city, North American tour in 2014. The new recording, Soul Fingers, is arguably Bobby’s most ambitious to date. Produced by the legendary drummer/producer Steve Jordan, Bobby once again revisits the music of his youth, this time employing a wide range of instrumental palates, in addition to palpable group interplay and his own, always soulful and singularly personal sound and style. The album is available on Amazon.com. Songs from GO TiME: Brooklyn 2, which include “Gracified” covers of classic Rolling Stones and Ray Charles hits, have already been seeing significant traction online. BuzzFeed Video’s Facebook clip of Fish and Chips a dancing saxophone duet with Leo P of Too Many Zooz, has reached over 400,000 views. The soulful fan favorite Feels Like Home has garnered a Grand Prize in 2018 John Lennon Songwriting Contest. For further information about Grace Kelly, visit her website at www.gracekellymusic.com. This album is released under Jazz Pop on CDBaby. Bass player, composer, arranger Yiorgos Zikoyiannis is mainly a session bass player and takes part in thousands of recordings and concerts in Greece and all around the world, since 1980. He recorded a double CD and tours in Spain with famous Leo Brower. He formed a jazz-trio with German guitarist Toto Blanke and drummer G.Trandalidis. He recorded 3 records with the famous singer “Fairuz”. He performed in concerts with singer Shirley Bassey. For 2 years he recorded and performed with the famous rock group “Socrates drunk the conium”. He performed in concerts with B.Bands of William (Bill) Russo and Dan Owens and also in B.Band performed with the famous trumpet player Rex Richardson. Atmospheres is a perfect anti-stress album featuring beautiful melodies and sounds. Basses in all roles, playing melodies, bass lines and even chords. Fender Rhodes and acoustic pianos along with magical pads, that sound like they came down from heaven. Get your copy on CDBaby.